Europe’s ATC providers are approaching the point of meltdown with a huge number of flights being cancelled every day because of ATC strikes, staff shortage, sympathy actions or due to old and inefficient air traffic management systems. During weekends the ATC problem reaches its peak, mainly due to rostering issues that end with a staff shortage and consequently drop the volume of aircraft in the airspace that can be handled by the local ATCs. It is the ATC in southern France, based in Marseilles, that is main headache for the airlines. This ATC controls the bulk of flights flying to and from Spain and there are very limited escape routes the airlines can fly to avoid this area. French ATC strikes and actions have increased by 300% versus the same period last year. ATCs in the UK, Germany, Greece and Italy also create problems for airlines by often being short of staff, resulting in reduced capacity in their airspaces. One noteworthy cause is the lack of education and training of new air traffic controllers. Why, one may ask, as this kind of work is very well paid, normally in the top 10 best paid jobs in a particular country, and recruitment should be easy if one passes the psychomotor tests (almost equal to tests used for pilots). However, for many years, the recruitment of controllers has been “controlled” by unions to create a manageable shortage and enable more overtime and extra pay to the current controller workforce. The fact that the volume of air traffic has increased more than predicted has hit this “controlled” recruitment scheme and today we see the results. Old equipment is another key factor. Each country in the EU is responsible for its ATC and airspace and in many countries investments in new ATC technology are far beyond requirements resulting in poor air traffic management that generates limitations in handling the increased number of flights. Despite the aircraft manufacturers and their suppliers providing state-of-the-art navigation technology in the planes, this does not solve the crowded airspace situation. Regardless the technology in the aircraft, the volume of planes in the airspace is defined by the ATC on the ground. The first six months of 2018 have been the worst in history in terms of cancelled and delayed flights. Ryanair and easyJet, the two largest LCCs in Europe, reported 3550 flights cancelled or delayed during April-June, Wizz Air reported 450 flights cancelled or delayed in the same period, a total of 4000 flights for the three LCCs. If adding Norwegian, SAS, IAG, Lufthansa Group, KLM-Air France and others, the number will surpass 8000 flights during April-June. That is on average 90 flights per day and effecting 17,000 passengers daily who get their flights cancelled or delayed. The total number of passengers impacted in April-June is estimated to be 1.5 million and this number comes on top of any other disruption like poor weather, airport congestions and internal airline issues. The airlines must take the costs, and the EU261 compensation regulation applies to flights cancelled less than 14 days ahead of departure or if the flight is delayed by more than three hours. A conservative estimate on total costs is not easy, but assuming 60% of these are within the EU261 regulation, it may cost the airlines €225 million and, in this example, the lowest EU261 compensation value (€250) for flights up to 1500 kilometres is used. The average flying distance for LCCs in Europe is 900-1200 kilometres. Looking into the first half of 2018, more than 16,000 flights were delayed due to ATC problems and more than two million passengers were affected, according to EuroControl. This will hit the financial results for some airlines hard, especially airlines operating most of their capacity in central and southern European destinations, like Ryanair, easyJet, Wizz Air, Eurowings and Vueling. Even worse is the 2018 forecast by EuroControl. It estimates a total of 14.3 million minutes of delay for the airlines, which is a 53% year-on-year deterioration. 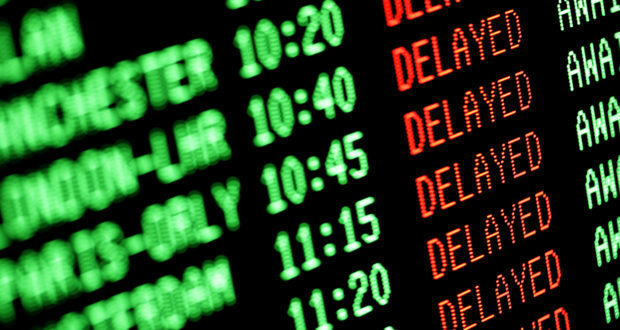 One minute of delay incurs operating overhead costs for the airlines of €70, costing European carriers more than one billion euros in 2018 if forecasts are met. Is the European Commission looking for solutions? One major hurdle for the EU in Brussels to get the ATC problems under control is the fact that the EU cannot overrule an individual member country. Each EU country rules 100% over its own airspace, making it complicated to find a solution that fits all EU members. Ryanair, easyJet, Wizz and IAG recently filed a joint complaint to the EU Commission on the ATC problems, where it clearly states that the airlines respect the right for strikes and industrial action, but the four pillars of the EU, the free movement of people, services, goods and money, must also apply in the air despite local ATC strikes or actions. The airlines claim the free movement of people is hindered by the cancelled and delayed flights and a solution must be found soon. One idea in the proposal is to allow flights at 30,000 feet and above to be controlled by other ATCs to make it possible to overfly airspace where the controlling ATC is on strike or operate with reduced capacity due to other reasons. It is not acceptable that ATC is exempt from the 48-hour warning clause on planned strikes or industrial action, and this must be improved as today the airlines often get notice at 23:30 on strikes, actions and reduced airspace capacity to take place from 06:00 the next morning. This must be changed and require a minimum 72-hour mandatory warning period for any ATC strike or action, the airlines state in their case to the EU. The EU Transport Commission has a tough task to solve, and if it is not successful the economic impact on airlines, businesses and the markets’ willingness to fly can be severe.